2001-07-09 Application filed by Vestek Systems, Inc. filed Critical Vestek Systems, Inc.
A method for arithmetic and geometric performance attribution which accurately links single-periods attribution effects over multiple periods. The arithmetic attribution method optimally distributes the residual to yield a minimum-distortion residual-free arithmetic attribution system. The geometric attribution method defines the attribution effects in terms of ratios. The arithmetic method determines portfolio performance over multiple time periods as sum of terms of form (R - R)(A + ). In all embodiments, the inventive coefficient (A + ) have smaller standard deviation than conventional logarithmic coefficients, which reduces variation in the weights assigned to each time period relative to the other time periods in the attribution calculation. The method to be performed on the computer having a processor (1), an input device (3) and a display (5). The present invention relates to methods for performing performance attribution to compare the returns of a financial portfolio against those of a benchmark, and attribute the relative performance to various effects resulting from active decisions by the portfolio manager. More particularly, the invention is an improved method for linking single-period attribution effects over multiple periods, using either an arithmetic or a geometric methodology. Attribution Effects Over Time," Journal of Performance Measurement, Summer 1999, pp. 5-14 ("Carino"). An advantage of the arithmetic approach is that it is more intuitive. For instance, if the portfolio return is 21% and the benchmark return is 10%, most people regard the relative performance to be 11%, as opposed to 10%. An advantage of geometric attribution, on the other hand, is the ease with which attribution effects can be linked over time. _4 = (l + R)(J-1) r, (R = R), where 7" is the total number of time periods. The inventive coefficients (A + at) have smaller (and typically much smaller) standard deviation than the conventional logarithmic coefficients (in cases in which A has the preferred value), which reduces variation in the weights assigned to each time period relative to the other time periods in the attribution calculation. is an attribution effect (sector selection), and the superscript G denotes "geometric". The attribution effects employed in preferred embodiments of the inventive geometric attribution method have more natural form than those employed in conventional geometric attribution methods (such as the geometric attribution method of the above- cited Carino paper), since the inventive attribution effects are defined as ratios rather than exponentials. Further, the inventive definitions allow the geometric attribution method to be performed more accurately than the geometric attribution performed using the attribution effects as defined by Carino. Other aspects of the invention are a computer system programmed to perform any embodiment of the inventive method, and a computer readable medium which stores code for implementing any embodiment of the inventive method. Figure la is a contour plot of the average logarithmic coefficients, determined in accordance with the prior art, resulting from a set of simulations. Figure lb is a contour plot of the average inventive coefficients resulting from the same simulations which determined Fig. la. Figure 2a is plot of normalized standard deviation for the conventional logarithmic coefficients, assuming the same set of distributions that were assumed to generate Figures la and lb. Figure 2b is plot of normalized standard deviation for the inventive coefficients, assuming the same set of distributions that were assumed to generate Figs, la and lb. Figure 3 is a block diagram of a computer system for implementing any embodiment of the inventive method. Figure 4 is an elevational view of a computer readable optical disk on which is stored computer code for implementing any embodiment of the inventive method. The arithmetic performance attribution method of the present invention is an improved approach to arithmetic linking over multiple periods. The methodology described herein is based on an optimal distribution of the residual among the different time periods. Such an approach minimizes the distortion that arises from overweighting certain time periods relative to others. The resulting attribution system is also residual free, robust, and completely general, so that performance can be linked without complication for any set of sector weights and returns. The geometric performance attribution method of the present invention represents a fundamentally different definition for the geometric attribution effects, since the attribution effects are defined in terms of ratios rather than exponentials. This form, which is more natural, also results in an improved approximation over previous methods. We interpret the terms in the first summation to be the issue selection tf = wβ(rft -Fft), (6) with the superscript A denoting arithmetic. The issue selection lt measures how well the portfolio manager picked overperforming securities in sector i during period t.
To summarize, the single-period relative performance has been fully decomposed into attribution effects at the sector level. These attribution effects, when summed over all sectors, give the total excess return for the period, Rt -Rt . Just as we define the relative performance for the single-period case by the difference in single-period returns, it is natural to define the relative performance for the multiple-period case as the difference in linked returns, R - R .
However, this naive solution is unacceptable because it does not necessarily reflect the characteristic scaling of the system. Furthermore, it may easily occur that the numerator and denominator of the above expression have opposite sign, in which case the entire linking process loses its underlying meaning. In alternative embodiments, A is taken to have some other value. For example, A = 1 or A = [(1 + R)(l + R )]1/2 in alternative embodiments. Observe that our result is fully additive, so that the total performance is defined as a sum of attribution effects, each summed over sectors and time periods. Furthermore, there is no unexplained residual. The inventor has determined that if one chooses the value of A to be the value determined by equation (14) (or equation (15), if R = R ), the standard deviation of the inventive coefficients of equation (19) is less than that for the logarithmic coefficients disclosed in the above-cited paper by Carino, namely the β^armo of equation (21), in all simulations performed. Thus, this choice for the value of A guarantees smaller standard deviation among the coefficients β estek than among the logarithmic coefficients taught by Carino. The logarithmic coefficients (21) are similar to their optimized counterparts (19) in that both lead to residual-free linking. However, the logarithmic coefficients tend to overweight periods with lower-than-average returns, and to underweight those with higher-than-average returns. This appears to be an artifact of the linking algorithm, and not to be grounded in any economic principle. 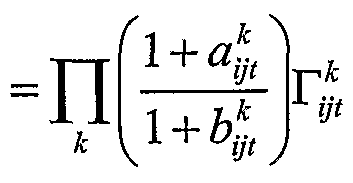 The optimized coefficients, by contrast, tend to weight each period as evenly as possible. We conducted a more detailed analysis comparing the inventive coefficients and the conventional logarithmic coefficients, using computational simulations linking single-month attribution effects over a twelve-month period. The portfolio and benchmark returns were drawn from normal distributions, with the standard deviation set equal to the absolute value of the mean return. The portfolio and benchmark distributions were kept fixed for the twelve-month period, and each data point was calculated by averaging the linking coefficients over 1000 sample paths drawn from the same fixed distributions. The mean monthly returns were then varied from -10% to +20%), in order to obtain an understanding of the global behavior of the linking coefficients. Typical annual returns varied from -70% on the low end to +800% on the high end. Figures la and lb show results of the simulations, with Fig. la being a contour plot of the average logarithmic coefficients and Fig. lb being a contour plot of the average inventive coefficients. In both cases, the coefficients increase from an average of less than 0.5 for the smallest returns to more than 6.0 for the largest returns. Furthermore, we see that for any combination of portfolio and benchmark returns, the average coefficient is virtually identical in both approaches. Evidently, the reason for this similarity is that the coefficients in the logarithmic algorithm also correctly account for the scaling properties. We then average σ over 1000 sample paths in order to obtain a good estimate of the average normalized standard deviation of the linking coefficients. The resulting contour plots are presented in Figures 2a and 2b. We observe fundamentally distinct behavior for the two cases. For the logarithmic coefficients, the normalized standard deviation increases in concentric circles about the origin, rising to over 10% for the largest returns considered here. By contrast, the inventive coefficients exhibit valleys of extremely low standard deviation extending along the directions R = ±R . This property of the inventive coefficients is very appealing because, in the usual case, portfolio returns can be expected to at least roughly track the benchmark returns. In other words, in the usual case, the inventive coefficients have a much smaller standard deviation than the conventional logarithmic coefficients. Although the results of Figures la, lb, 2a, and 2b were obtained for a twelvemonth period with specific distributions, the inventor has conducted extensive simulations with different periods and different distributions and has found that the results are entirely consistent with those shown in Figures la, lb, 2a, and 2b. It is natural to ask what kinds of differences might arise in practice between the two sets of linking coefficients. In Table 1 we present a hypothetical set of portfolio and benchmark returns for a six-month period, together with the resulting linking coefficients for the logarithmic and optimized cases. We note that the standard deviation of the optimized coefficients is very small, with the coefficients ranging from roughly 1.41 to 1.42. For the logarithmic case, on the other hand, the coefficients range from 1.26 to 1.54. The linked portfolio and benchmark returns for this example are 64.37%) and 39.31%, respectively, for an excess return of 25.06%. h Table 1 we also decompose the single-period relative performance into issue selection if and sector selection Sf , where these attribution effects represent the total summed over all sectors. The values were specifically chosen for illustrative purposes with the average single-period issue selection and sector selection being equal. Applying the logarithmic linking algorithm, we find that the linked issue selection is 10.88%, and that the linked sector selection is 14.18%. Using the optimized coefficients, the corresponding values are 12.52%) and 12.54%, respectively. In both cases, the issue selection and sector selection add to give the correct relative performance of 25.06%, so that there is no residual in either method. However, the optimized approach more accurately reflects the fact that, on average, the issue selection and sector selection were equal. Table 1 Comparison of the logarithmic (βf"""0) and optimized (βfestek) coefficients for a hypothetical six-month period. Portfolio and benchmark returns are given by R, and R, , respectively. Also presented are the single-period issue selection if and sector selection Sf . One of the nice features of geometric attribution is the natural way in which the attribution effects link over multiple periods. In order to fully exploit this characteristic, however, the geometric attribution system should exactly mirror the arithmetic system. In other words, just as attribution effects are combined arithmetically in terms of summations, they should be combined geometrically in terms of products. with Sf given by equation (7). It is easy to verify that for the case of small returns, Tt approaches unity and that jG.vestek ^ gG,ve S tek approach their arithmetic counte arts, if and S^ , respectively. This property, which is shared by the Carino attribution effects, is required in order to preserve the intrinsic meaning from the familiar arithmetic definitions. The total geometric sector selection St ' es e for period t is given by the product H ι,ι.ι- ι( ,.- ιf, ,„„if it,„!f ,„«(, •.•■ ""ir,.,ifc „;;» if,„ιr . Equation (33) is the fully geometric analog of equation (9). = πΪTN 1 + I? 'ra**)Q- + S°>Vestek). (35) l + R ,=ι w where lf estek is defined in equation (27) and SfVestek is defined in equation (29). l±! .= πf[(l + Iff Cfl""°)(l + S 'Carl"°) , (36) l + R t=l !=1 with l Carim and Sft 'Carino given by equations (24) and (26) respectively. The attribution effects defined in preferred embodiments of the inventive geometric attribution method (including the embodiment to be described with reference to equations (42)-(49)) have more natural form than the conventional attribution effects (such as those employed in the geometric attribution method of the above-cited Carino paper), since the inventive attribution effects are defined as ratios rather than exponentials. The computer system of Figure 3 includes processor 1, input device 3 coupled to processor 1, and display device 5 coupled to processor 1. Processor 1 is programmed to implement the inventive method in response to instructions and data entered by user manipulation of input device 3. Computer readable optical disk 7 of Fig. 4 has computer code stored thereon. This code is suitable for programming processor 1 to implement an embodiment of the inventive method. Although the invention has been described in connection with specific preferred embodiments, various modifications of and variations on the described methods and apparatus of the invention will be apparent to those skilled in the art without departing from the scope and spirit of the invention. For example, in variations of the above- described embodiments, the effects of currency fluctuations in a global portfolio are accounted for. R -R = ∑(A + at)(Rt - Rt) . _4 = (l + R)(r"1)/r. 3. The method of claim 1, wherein A = 1.
where /^ is an issue selection for sector i and period t, and S^ is a sector selection for sector i and period t.
,=1 a display device coupled to the processor for displaying a result of the arithmetic performance attribution computation. and a display device coupled to the processor for displaying a result of the geometric performance attribution computation. l + R N M determining the portfoho performance as — ___- = J J ^[ (1 + Q?t ) ; and l + R ,=1 <=ι =ι a display device coupled to the processor for displaying a result of the geometric performance attribution computation. Dissanaike 1997 Do stock market investors overreact?